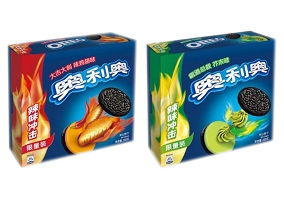 Leading bakery and snacks producer Mondelez International has announced the launch of its cookie brand Oreo in two unconventional flavours. A limited edition for the Chinese market, the new Hot Chicken Wing flavour, featuring a buffalo sauce-esque orange cream, and Wasabi green, were announced by the firm on Twitter. Mondelez International has also announced a contest on Twitter and Instagram that invites Oreo fans to suggest the next limited edition, for its US market. In previous years, Mondeleze has unveiled limited edition Oreo biscuits in flavours such as Marshmallow Peep, Swedish Fish, and Firework.